The Vale of Lune meet Altrincham on Saturday. Vale of Lune’s seconds suffered their heaviest defeat for many seasons over at Caldy in the Premier League going down 103-8 on Saturday. The ever improving Archie Rich scored their only try late in the game after Neil Walker had given the Vale the lead in the fourth minute before the floodgates opened. The fourth team travelled to take on Burnley 3 without any replacements and went down 34-0 against a side a side boosted by a second team cancellation. Back at Powderhouse Lane the Vikings were left kicking their heels when West Park St Helens cried off. On Saturday, Vale’s first team travel to Altrincham Kersal who bounced back into North One West after only one season in South Lancs/Cheshire One finished top of the league with only two defeats. 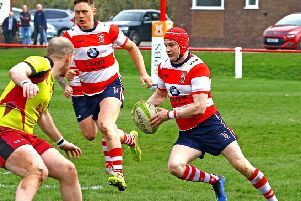 Altrincham Kersal have only lost one of their five fixtures this season, away at Wilmslow, 31-12. Last week they won impressively away at Leigh 41-3.